Take a journey through the dark, twisted, and demented mind of an insane funeral home owner who murders at night to bring more and more business to his family owned funeral parlor. Barely keeping the doors open he enlists the help of his psychotic family to help him. When you start your tour into the all new 2015 Night Terrors 13 Haunted Attractions, you will be engulfed in special FX and props and sets never seen before . You will start down the long dark corridor of the funeral home and be trusted into an actual funeral that will leave you wondering is this real or just my imagination. YOUR SANITY MAY NOT SURVIVE! !!! Continue to explore the decrepit insane property of this horrifying funeral home. Making your way through all the rooms and then being cast into the cemetery where the dead ravage the night and stalk your every move. Move quickly, you mustn't make haste or you'll be taken by the undead. Laser light shows, CGI images, pneumatic props, and professional actors await you to make sure your journey through Terror is hell and finally, at the end, your demise is completed. 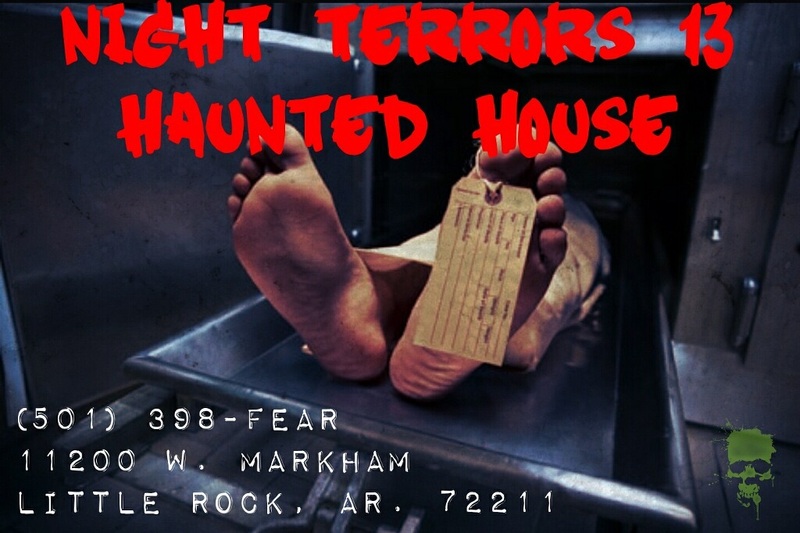 You must Survive a 24 foot long claustrophobia tunnel as well as the interactive portions of this haunt. You may get a little bit dirty and wet if you are not careful. Finally you will be cast into the home of the caretaker shack and taunted and possibly captured and tortured beyond your worst fears. Then just as you think it's almost over and you are safe you realize you haven't even made it half way through. Finally you will end up in hell where you will be tossed onto the fire and witness a 3D black light chromadepth attraction that is sure to amaze. Be careful though you may or may not make this one as the tortured souls and Victims will be there watching and lashing out in anger and jealousy that you are still among the living . Or are you ??? Colonial wine and spirits liquor store .